The wolf has naturally recolonised the Alpes in the last decades. But the wolf’s precense in a densly inhabited and used region, such as Central Europe, arises conflicts. Particularly, livestock owners and hunters oppose the comeback of the wolf. Many wolf opponents keep raising the argument of a high rate of hybridisation as a reason to shoot wolves. However, Swiss scientists came to the result that the dog introgression in the Swiss wolf population is very limited. This result debunks the argument that hybridisation would be a problem in the alpine wolf population. Please also read: Wolf hybrids, friends or foe? Wolf-dog hybrids have been reportet all over Europe. Particularly, hybrids from male dogs and female wolves were subsequently integrated into wolf packs and backcrossed with wolves again. Several studies conducted in the last years took a closer look on the modality of wolf-dog hybridisation in the European wolf populations. 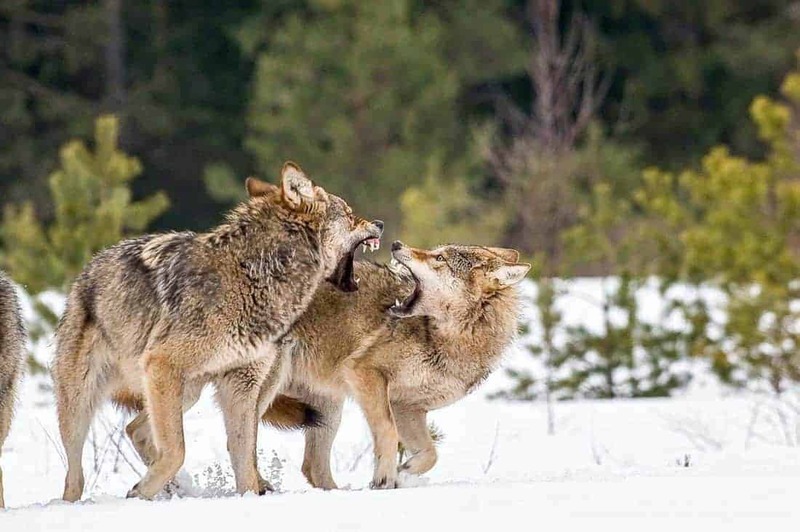 Overall, the rate of hybridisation strongly depends on the level of disturbances to the wolf populations. This particularly means the presence and abundance of feral and stray dogs, for example close to anthtopogenic environments. As expected the rate of hybridisation is low in Western Europe, with for example 0 to 6,5% across the Italian Appenines and the Iberian Peninsula. Eastern Europe on the other hand shows higher percentatges, with 10 to 14% in Georgia, Bulgaria and Greece. This can be lead back to the high number of free-ranging dogs. The Bern Convention lists the Alpine wolf population as “endagered”. However, hybrids often fall into a legal gap. It is recommended to remove them in order to protect the integrity of wild wolf populations. The majority of the alpine wolves live in the Western parts of the Alpes between France and Italy. Only three packs established in Switzerland even though tens of individuals migrate thtrough the country every year. The rumor of wolf-dog hybrids is widespread in the public and is often used as a reason to minimise the wolf population. Debunking this argument is incredibly important to guarantee an objective discussion about the future wolf management and the wolf’s social preception in Switzerland. Scientists from the University of Lausanne conducted a long-term genetic survey of detected wolves in Switzerland and adjacent regions. The survey is part of an ongoing non-invasive genetic monitoring that started when the first wolves settled in the country, so more than 20 years ago. The scientists genotyped thousands of DNA samples and perfomed admixture analyses of genotypes of putative wolves and reference dogs. The objective was to estimate the hybridisation and admixture rate in the newly colonised Alpine wolf population. In the end the scientists were able to assign 1 645 samples of wolf salvia, faeces, blood, hair and tissue to 115 individuals. The samples of these individuals were collected between 1998 and 2017. The scientists then compared them with reference samples from 70 dogs. Our results prove that dog-wolf cross-breeding is very limited in reality, even anecdotal, and that the genetic integrity of wild wolf populations livin in the Alps remains intact. The Swiss laws recommend the culling of hybrids to preserve the integrity of the pure wild populations. However, Luca Fumagalli implies that controlling the presence of stray dogs that transfer their genes to wolves would be the crucial taks in keeping hybridisation low in the future. In addition, the data in Table 1 provides more proof that hybridisation rate in many countries is lower than the numbers claimed by people against their presence.